This entry was posted in Just Life on August 31, 2014 by Steve Tilford. Kind of made a spur of the moment plan change Friday and headed back out to Colorado. It seemed like there were too many positives to skip the trip, so I changed Trudi’s ticket back from San Francisco and made it to Denver. My friends Stacie and her family are renting a 3 bedroom condo in Vail, then Keith and Catherine Walberg were up for a 3 days Labor Day vacation, and Bill wanted to drive out, so that’s what we did. Trudi and her mom went to the airport and parted ways, then Trudi’s flight was cancelled, but she got put on an early flight and arrived in Denver a couple hours early. We picked her up and headed to Vincent’s in Arvada. There is a crazy amount of traffic on I-70 on holidays, so we at dinner in Arvada and waited until 10 pm to head up I-70. 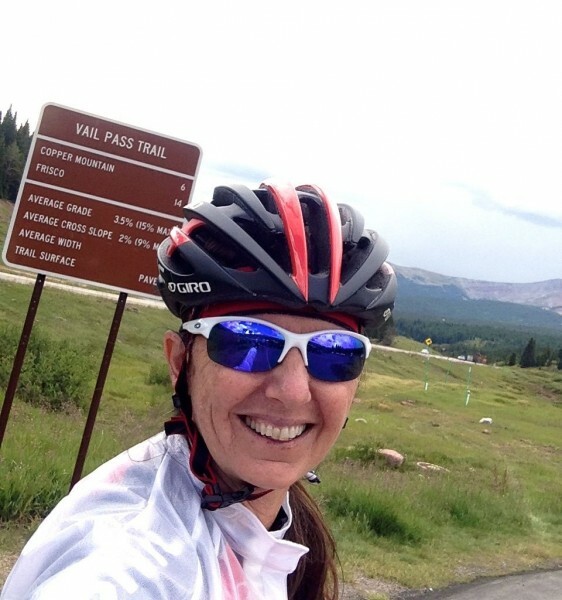 Yesterday we rode over to Vail and back. It is about 70 miles roundtrip, climbing over Vail Pass both directions. It was warm and sunny when we left, but like it has been all year for me up in the mountains, started raining when we just got back to the top of Vail Pass on the way home. It wasn’t as cold as it was a week ago, lower 40’s this time, but it rained a bunch. Pretty soon we were all frozen from descending wet. We all had full on rain gear, but that wasn’t enough. Eventually Bill and Vincent ditched us, so I rode back with Keith and Catherine. It is funny your thought process when you’re wet and cold. We all wanted to stop in Copper Mountain or Frisco, to try to warm up some, but realized that if we did stop, it would be nearly impossible to get moving again. So we persevered. We got a small break in the rain, right about when we got back to Frisco. It is amazing how much you can warm up when you take the water out of the equation. We were planning on doing a longer ride today, closer to 85 miles, but it is raining pretty good again and it looks like that might be the story of the whole day. That’s no good. Okay, sounds like people are making plans for the day. I hear hiking up to some high lake. I can’t hike. I can barely walk around Vail with the puppies after dinner. It is so funny how it is easier riding than walking. I’m going to spend some time with Stacie today trying to figure out some of my ortho problems. Probably the best use of my day. Gang sitting in Vail yesterday mid-ride. Vincent’s head really isn’t that narrow. 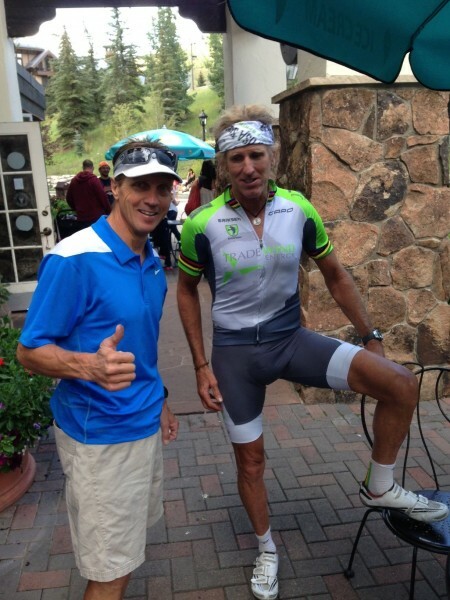 I ran into my friend, Mike Kloser, yesterday in Vail. Mike was my in to have surgery at the Steadman Clinic last February in Vail. He is a great guy and phenomenal athlete. Trudi did her first real ride in over a month. She got dropped early on, but kept going to the top of Vail Pass. She has a little chocolate Gu on her lower lip, it seems. Here’s a little Sunday morning fun. It is only 3 minutes and is pretty amazing. Glad to read your pedaling again ST.
No complaints,just interesting to hear from a billion mile club rider. For me,this topic of riding being more accessible than walking sorta segues into the present day advent of the electric-power assist bicycles.. I don’t have one,but a # of my 60+ yrs on pals do. Their 60+ yrs on temperament keeps speeds in check, w trails courtesies being paramount at all times. But, as within every highly populated area, the incidents of rapidly ascending mooks on electric assist bikes is starting to register on the complaint-o-meter within SF area dirt trails. Perhaps you’ve already written on this topic, but I, for 1, would be interested in hearing your take on it if you’ve got 1. I don’t want this to sound wrong, but. . . Steve have you ever had a job? How does someone pull this off? Better yet might be the question do you have a trust fund? Either way your Jack Kerouac existence is impressive. Maybe a book? Actually, I would be interested in maybe even an entire book describing how you have financially succeeded so well as a professional cyclists in the US for so long. Living vicariously through your blog!